ABSOLUTE WATERFRONT New Beach house. Built with the beach as the garden and private beach access. Built and furnished in modern Balinese style, this executive house has 2 levels both enjoying sensational views of Jervis Bay and Calalla Beach. The beach side lawn ends on the beach. There is a large patio on the lower level with huge sliding glass doors which open to allow the open plan living area to extend out onto the patio, the lawn and then the beach and bay. The lower level is large and open plan. The wheat coloured porcelain tiled throughout. The dining area has a large timber table. It opens onto the covered Bali terracet screen with its teak table and glass roof. The ultramodern designer kitchen sports white stone bench tops, glass top cooker, large high speed microwave oven, fan forced eyelevel oven, near silent dishwasher, Masterchef style spring mixer tap, large deep double bowl sink, garbage disposal, 500 litre 2 door fridge, self closing kitchen drawers. The Tv area has large TV, DVD player and satellite /cable TV. The Conversation area is furnished in Grey leather couches and has seating for 10. The Lounge area is comfortable with stylish Gery leather and glass and enjoys water views. The lower area hes stainless steel ceiling fans over each area and each area has lighting texture control. We are conscious of guests with allergies and we therefore cannot accept pets. 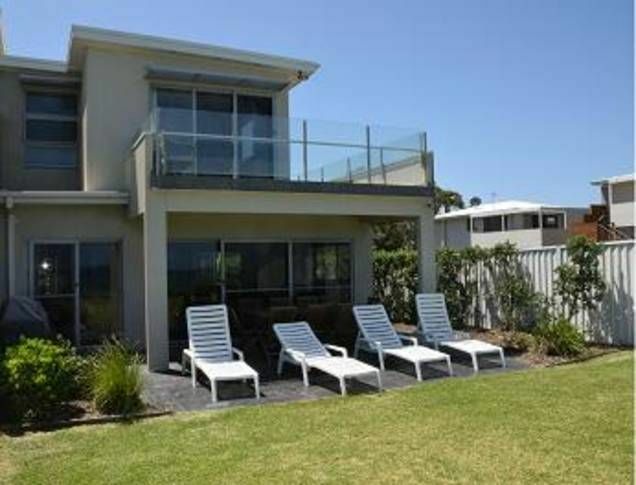 Whitebeach is one of the very best houses on the beach front and is a holiday makers delight. It is no wonder it is one of the most popular houses with many families coming back year after year. The upper level has magnificent polished timber floors. Bedroom 1 opens onto a large balcony with magnificent views across jervis bay. The bedroom has a queen sized Timber bed and pillow topped matress for sleeping comfort. The ensuite bathroom has views across the bay. Bedroom 3 has a two single beds in adjacent configuration. All the bedrooms have large built in cupboards and ceiling fans. Bedroom 5 upstairs media room has Tv and Dvd as well as a queen sized sleeper couch. It has large balcony/terrace to enjoy the morning sun. The upstairs Bathroom has full sized bath and separate shower. All upstairs rooms enjoy extensive water views. Bedroom 4 ( suite) is on the lower level and has queen sized timber bed and ensuite bathroom. It opens onto the Bali Terrace. We had a fantastic stay at Whitebeach, great location, a very clean, well equipped and comfortable home. We had a great time staying here. As a party of 10 we found this house catered for us all comfortably. Everything that you need at your fingertips. Absolute waterfront to a pristine beach. We will definitely be back again. everything you need for a little getaway. Beautiful spot! Loved sitting and just relaxing watching the ocean. Can’t wait to go back! !